Stepfamily Books on Stepparenting and Stepfamilies, How To Stepparent - The Stepfamily Foundation Inc. This audio book is professsionally produced by one of the greatest names in audio book publishing---Nightingale Conant.It features actors, music and is narrated by Dr. Jeannete Lofas. Actors act out the stepfamily dilemmas and dynamics and Lofas addresses the solutions. This audiobook is one that we highly recommend for children over ten. It is also great for reluctant men in stepfamilies who have no time to read. We suggest to her when taking trip by car that she simply plays fifteen minutes as a time. Partners are grateful for this easy way of learning.Production values are high and it is the shortest and most entertaining of our audios. STEPPARENTING, the world's best selling book on stepparenting, 3rd Edition. For couples in step situations, making it all work can be an awesome challenge. In this newly revised and updated edition Stepparenting, Jeannette Lofas Ph. D., LCSW draws on her twenty-year track record of counseling and coaching stepfamilies and provided up-to-the minute advice for dealing with the many baffling and emotional issues that beset them today. Setting up a household-yours, mine, or ours? Practical, supportive, and utterly authoritative, Stepparenting provides all the techniques tools and strategies you need to make a happy and successful stepfamily. It has been translated into numerous languages. Jeannette Lofas Ph. D., LCSW, the pioneering founder of the Stepfamily Foundation, Inc., is a certified divorce and co-parenting mediator and received the 1995 National Parents' Day Award from President Clinton. One of the most popular books on The 21st Century Family. Now that more than 60% of American families are divorced, re-partnered or single parent households, the rules for running the house have changed. Would you like to create a well-run family team where you are clearly the leader? Would you like to come home to a house where everyone says please and thank you, shares the housework, and truly enjoys dinner together? Do you long for a homelife where children feel loved and cared for and you feel respected and in control? FAMILY RULES not only gives you the tools you need to create a happy well-run family but the parenting skills to develop character, self-discipline, and self-esteem in children. Easy to institute and easy to follow, FAMILY RULES is the best way to bring stability and tranquility to your home. The first book ever written to look at the stepfamily from all points of view. It depicts the point of view of each member. There are 60 million stepparents in the United States today. 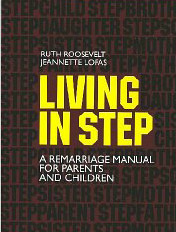 Prior to LIVING IN STEP,no book had been written that defines the problems and offers advice on conflicts endemic to each member of the stepfamily. How does a stepparent deal with natural hostility encountered from the stepchildren? Who comes first?By identifying the roots of the problems LIVING IN STEP helps step-people achieve family harmony they often did not think possible. HE’S OK SHE’S OK, Honoring the Differences Between Men and Women. Is an unbiased, supportive and well-documented, well-researched and fun-book about the confounding, delightful and daunting differences between men and women. It depicts the causes of conflict and invites men and women to know and honor their differences. It focuses on: mental, emotional, ways of being, feeling, seeing, and saying that takes place in 80% of men and women. Research from around the world is cited. We delineate, humorously depict, and draw no conclusions. The differences are made clear with pictures, descriptive columns and well-explained text. 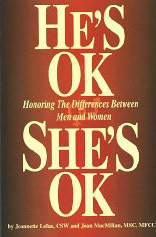 He’s OK, SHE” OK is “must have” for today’s men and women. P.S. We have found that in our work with couples once we stabilize the initial stepfamily conflict, the issue unclear concepts gender differences and how they drive, set at odds the couple becomes an issue. This holds true for over half of the couples in our practice.